Posted on December 31, 2015 by Warin	in American Black Film Festival, Beyond The Lights, Chef, Creed, Dope, Movies of the Year, Rick Famuyiwa, Shameik Moore, The Martian, Twitter, Zoe Kravitz. Once again it seems like another year has flown by. It feels the older I get, the quicker time seems to move. In terms of pure post output, this was my least productive year on the blog since its inception four years ago. I could use the same excuses of work, side projects, and other commitments, but the truth is, I have to be more disciplined in my time management and more consistent in my posts. With that said, though my posts were down considerably this year, I did manage to make it out to see some quality films. Last year I didn’t have a movie of the year, but there were nevertheless quality films I saw like “Beyond The Lights” for example. For 2015 my movies of the year are “Dope” and “Chef.” I picked these films for very different reasons above the other titles I saw over the last 12 months. 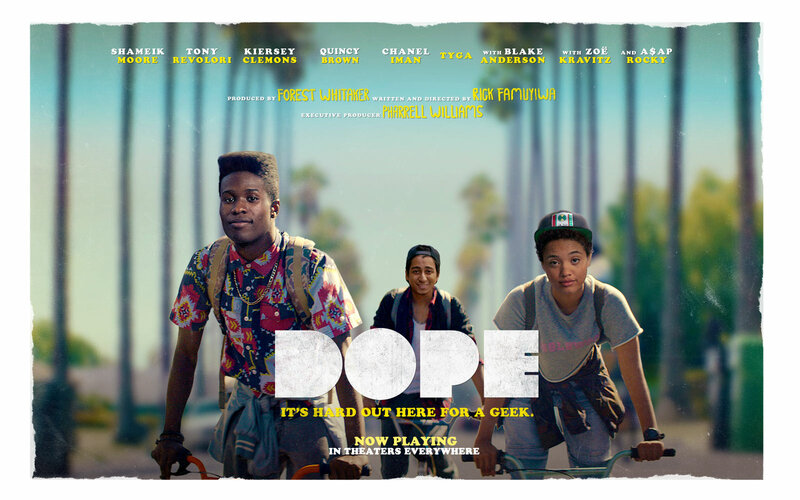 I saw “Dope” while attending the American Black Film Festival last June and the film actually headlined the event. “Dope” centers around a high school senior named Malcolm played by Shameik Moore, and his two friends who are nerds at their local high school in Inglewood, California. Malcolm and his friends get invited to a party where a shootout occurs and Malcolm runs out only to find the drug Molly has been slipped into his bag. To make matters worse, he realizes he must sell the drug without being caught/killed all the while applying to get into Harvard. While the story takes place in the hood and involves drug dealing, I wouldn’t consider this a ‘hood movie.’ The actors and director Rick Famuyiwa do a good job of making this film feel lively and even somewhat innocent despite its serious subject matter. Zoe Kravitz is very good in this film as well. 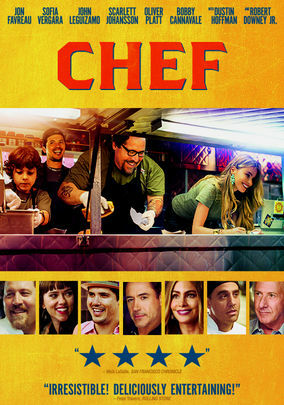 “Chef” is one of the more heartwarming films I’ve seen in years. The story involves chef Carl Casper, played by Jon Favreau, who works at an upscale L.A. restaurant and wants to change up the menu and inject some of his own style into the meals. When he is denied by the owner and told to follow the menu as is, he follows orders and is subsequently ripped by a noted food critic for being bland and boring. Casper goes off on the food critic in a very public manner befitting our cellphone crazed TMZ reality that is 2015 and ends up quitting his job. Unemployed and unable to find suitable work, Casper’s ex-wife played by Sofia Vergara, suggests he go down to Miami and rent out a food truck owned by her ex-husband Marvin, played by Robert Downey Jr. Hesitant at first, Casper takes her up on the offer and he begins to build his business. Along the way one of his former co-workers comes along to join him and so too does his son. The three of them start out locally in Miami before taking their show on the road and travelling throughout the South, building buzz along the way via Twitter. This film is incredibly multi-layered. There’s the father-son dynamic, the following your dreams aspect, and even a touching resolution at the end. I highly recommend this film to anyone, and it’s also a movie that would be appropriate for just about any age group. It’s currently playing on Netflix as of this writing. Here’s to more quality films in 2016. Posted on January 19, 2015 by Warin	in Beyond The Lights, Gina Prince-Bythewood, Gugu Mbatha-Raw. A few weeks ago director Gina Prince-Bythewood, penned an open letter urging audiences to see her latest film, “Beyond The Lights.” Having had the chance to view the film twice myself, I wholeheartedly agree more people should see this film. “Beyond The Lights” stars Gugu Mbatha-Raw as pop star Noni, and Nate Parker as Kaz, the police officer who saves her life after an apparent suicide attempt. After saving her life, Noni and Kaz become close and their relationship evolves, much to the chagrin of their doting parents. Throughout the film we see the evolution of their relationship and despite coming from two completely different worlds, we see them as just two people in love attempting to put aside the distractions. 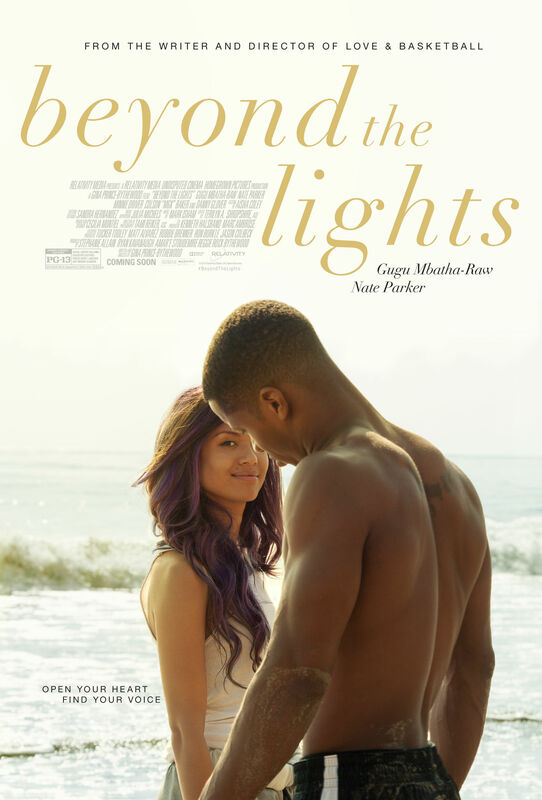 What we really struck me with “Beyond The Lights” is that as the film progresses we see the varying layers of Noni and Kaz’s lives peel off as both are struggling to find themselves while exploring each other. Another underlying theme of the film deals with the hyper sexualization present within the music industry, specifically as it relates to female artists. “Beyond The Lights” is probably out of theaters at this point but should be coming out on Blu-Ray/DVD in February. I definitely recommend giving it a look.